Competella have been developing Attendant Console, Contact Centers and Office User Add-ons for Skype for Business since 2010 and are now developing for Microsoft Teams. We have lots of experience from customers who have chosen to rip and replace their legacy PBX or simply migrate stepwise to Skype for Business. Competella provides an overall more simple and effective solution for our customers and partners who needs Attendant Console or Contact Center to streamline and manage customer communication. 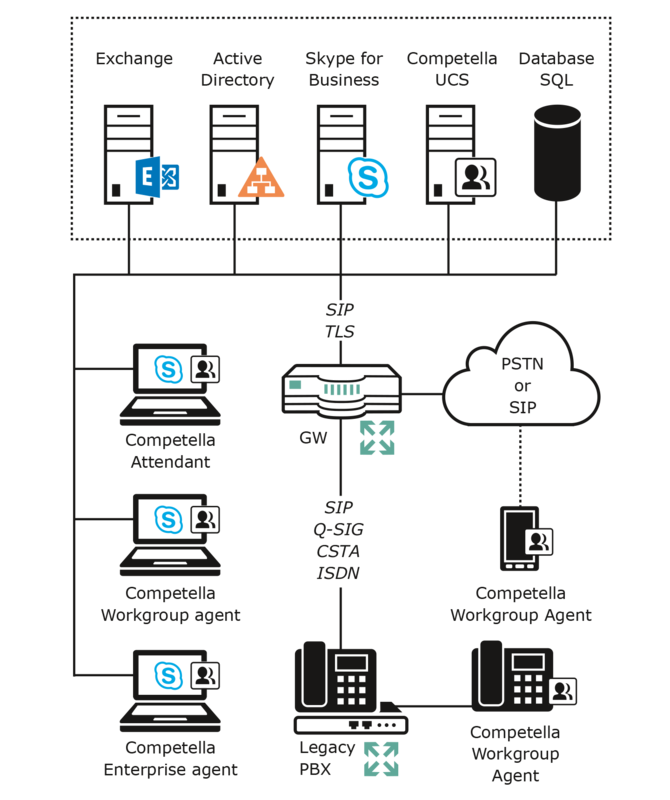 Competella supports enterprises and companies who plans for a migration from Skype for Business to Teams or a hybrid setup with Cisco Unified Communications Manager & Skype for Business. A hybrid solution includes the option to show the Cisco linestate in the Competella Attendant Console and Contact Center Enterprise Agent user interface. Competella is part of the Technology Adopters Program (TAP) for Microsoft Teams Calling API and our solutions are qualified for Lync 2010, Lync 2013 and is pending certification for Skype for Business Server 2019. The Competella Unified Communication Suite can be set-up in various redundancy and high availability configurations for local, regional and global companies, both in dedicated set-ups as well as multi-tenancy platforms for Hosters and Serviceproviders. The coexistence between Microsoft Teams and Skype for Business are not only limited to collaboration capabilities, but furthermore involves chat, calling and meeting capabilities. Some capabilities and functions will overlap depending on how your company's structure and licences are structured for a given user, but the default mode is to run the two applications alongside each other. As Competella are developing for both applications, the various Competella User Add-ons will differ from company to company. However, one thing is always applicable - which is the high quality of standard and service, that we here at Competella will be able to provide when supporting your way of transitioning to a Competella Communications solutions. If you would like to know more about our support and your way of transition to Microsoft Teams with Competella - please contact us by filling our contact formula for business enquiries and send Competella a message. Want more technical & migration information?